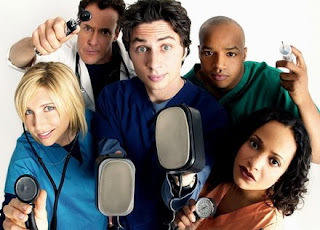 "This half-hour comedy focuses on the bizarre experiences of fresh-faced medical intern John "J.D." Dorian as he embarks on his healing career in a surreal hospital crammed full of unpredictable staffers and patients – where humor and tragedy can merge paths at any time." Here is a link, it's also available on Youtube where you can search it. With the season 8 starting this January, you have a lot of catch up to do.